Every website has a domain name – What are they? A domain name is simply a human-usable name for a website. It may also be called a URL or Uniform Resource Locator. The domain name system (DNS) is overseen by ICANN, the Internet Corporation for Assigned Names and Numbers, a private, non-profit corporation created in 1998 . ICANN is responsible for managing and coordinating the Domain Name System to make sure that every address is unique and that all users of the Internet can find all valid addresses. The Domain Name System (DNS) helps human users to navigate to websites on the Internet. Every device connected to the Internet has a unique address – just like a telephone number for your home. The unique address is numeric or alphanumeric and is called its “IP address” (IP stands for “Internet Protocol”). Numerical IP Addresses are hard to remember ( the IP address of you computer connection to the Internet is here ) but are necessary for computers to operate efficiently. The DNS makes using the Internet easier by allowing a familiar string of letters (the “domain name”) to be used instead of the computer-usable IP address. So instead of typing 207.151.159.3, you can type www.internic.net. It is a “mnemonic” device that makes addresses easier to remember. A domain name consists of two separate parts. The part that follows the dot is called the top-level domain (TLD) or the extension. The part to the left of or preceding the dot is the second-level domain or the label. The label is the part most likely to be associated with your website or email address. 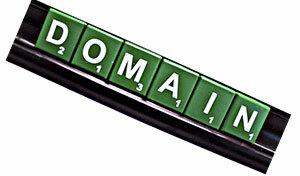 Generic top-level domains (gTLD) are generally considered to be .com, .org, .net, and .info. These are unrestricted gTLDs meaning that they are not restricted in who may register them, although .com is generally thought of as a business name and .org as belonging to a non-profit organization. An example of a restricted gTLD is .edu, which is reserved for educational institutions. The Internet Domain Name System has a directory of all the domain names and their corresponding computers registered to particular companies and persons using the Internet. When you register a domain name, it will be associated a location on the Internet you designate during the registration process. When you register the domain with a registrar the registrar will associate the domain name with one of their generic pages that either shows your domain is ‘in progress’ or displays ads for their services. Your new website will replace their generic page when you establish your website. Domain names can be registered through many different companies (known as “registrars”) which compete with one another for your business. A listing of these companies appears in the Registrar Directory on the ICANN website. Most website hosting companies are also ICANN registrars. The registrar you choose will ask you to provide various contact and technical information that makes up the registration listing. The registrar will then keep records of the contact information and submit the technical information to a central directory known as the “registry.” This registry provides other computers on the Internet the information necessary to send you e-mail or to find your web site. You will also be required to enter a registration contract with the registrar, which sets forth the terms under which your registration is accepted and will be maintained. If you prefer that your personal information not appear when someone researches a domain name, most registrars offer a privacy service for a fee that is added to the normal domain registration fee. If you select domain privacy when someone researches the domain name registration they will obtain only the contact information for the registrar that you used to register the domain name. How do know if a domain name is available? Most domain name registrars allow you to put a proposed domain name into a ‘search’ box and find out if the name has already been registered. There are also websites such as DomainTools.com that allow you to search for domain names and see who, if anyone, has registered the name. The advantage of simply using a registrar is that if you find an available name you can immediately register it in your name. If a proposed domain name is not available most registrars will suggest similar names that are available. Does registering a domain name mean that I have a website or an email address? A domain name is not a website, it is only a location where a website may be found. A website is a group of text files that are written with a computer language that your web browser, such as Internet Explorer, FireFox, Chrome, Safari, etc., can interpret and then display. The website files are stored on a computer called a server that receives requests for a particular web page and then “serves up” the content on the page by sending it to the requesting device. Some domain registrars which are also website hosting companies provide the ability to set up a single email address that is associated with a domain name without having to establish a complete website. Other registrars which are not hosting companies (such as Hover.com) may also have an option to establish email addresses associated with a domain registration. ICANN has an 18-page downloadable (pdf format) beginners guide to domain names available on their website. They also have a guide to IP addresses and several guides covering the operation of ICANN and how you can participate.